Audrey Hepburn (1929–1993) British actress and humanitarian. Hepburn was a major Hollywood star of the 1950s and 1960s, starring in classic films such as Roman Holiday (1956), The Nun’s Story (1956) and Breakfast at Tiffany’s (1961). 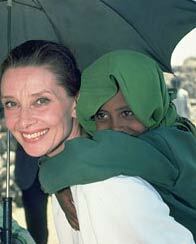 Audrey Hepburn later retired from acting and served as an ambassador for UNICEF. Audrey Hepburn was born to an English father and Dutch mother in Belgium, May 4th, 1929. Her father’s job as an insurance agent meant the family often moved between England, Holland and Belgium. In 1935, her parents divorced; one reason for this was that her father was a Nazi sympathiser. The divorce was very traumatic for six-year-old Audrey; she would later say it was the most traumatic incident of her life. After the war, despite suffering under the Nazi occupation, Audrey later tracked down her father to Dublin and supported him financially. From 1935–38, Audrey went to boarding school in Kent; in 1939 her mother moved the family to Arnhem in the Netherlands, where she thought it would be safe from Nazi invasion. However, in 1940, the Netherlands was overrun, and the country fell under Nazi occupation until liberation in 1945. During this time, Audrey went to school at the Arnhem conservatory where she also studied ballet. At one time she considered taking ballet as a career. During the occupation, it was said she would often dance in various locations, helping to raise money for the underground movement. Towards the end of the war, the occupation of Netherlands became increasingly brutal. After the D-Day landings of 1944, the Germans took most of the pitiable rations of the Dutch, leaving many to starve or freeze to death. Reprisals and shootings against the local population were common. As a young girl, Audrey saw her uncle and mother’s cousin shot in the street by the Germans. She also recalls seeing a trainload of Jewish children being herded into cattle trucks for deportation. The harrowing experiences of war left a profound mark on Audrey; it was one reason for her later commitments to the UNICEF children’s charity. She felt a natural empathy and sympathy for children who were the victims of war and starvation. During the war Audrey suffered anaemia, respiratory problems and oedema (swelling of the limbs) Audrey later noted a similarity between her wartime experience and that of Anne Frank. She read her diary in 1946, and said it “left her feeling devastated.” However, despite the ongoing horrors of the occupation, Audrey passed her time through drawing and practising ballet. After the war, Audrey went to London where she continued to practise ballet. She had great talent, but her height and malnutrition during the war meant that she was unable to become a really great ballerina, and so decided to seek work as an actor. 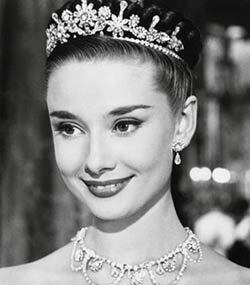 After several minor roles in films such as The Lavender Hill Mob, Audrey was chosen to play Gigi, a hit West End play. She was given an award by the theatre world for the best debut performance. Her first film was Secret People in 1952; a film about a prodigy ballerina, which was a natural choice for Audrey to play. It was during the filming for this that she was spotted by director William Wyler. 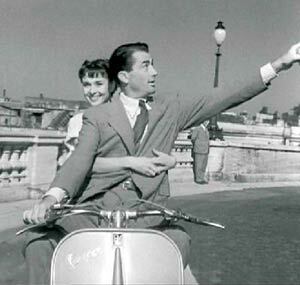 He was producing a film “Roman Holiday”, and he felt the innocence and elfin beauty of Audrey Hepburn would make a perfect choice for the English Princess, who spends a day in Rome in the company of Gregory Peck. The film was a great hit, and on the advertising, Audrey Hepburn was given the same billing as Gregory Peck. In many respects, Audrey outshone her more illustrious lead Gregory Peck; as Peck predicted, it was Audrey who would be given an Oscar for her performance. This film established her place in Hollywood’s elite and allowed her to play against many of the leading men of the time. For example, Sabrina with Humphrey Bogart and opposite Fred Astaire in Funny Face. Although she was one of Hollywood’s great stars of the 1950s and 1960s, she didn’t allow her fame to go to her head; often she would be quite happy to stay at home with her family. Her son wrote a moving tribute to his mother in his book Audrey Hepburn, an Elegant Spirit: A Son Remembers (1999). 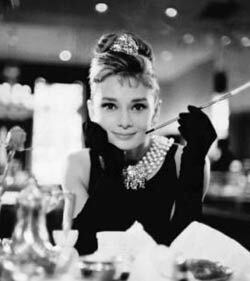 In 1961, Audrey played one of her most demanding roles, the extrovert Holly Golightly in Breakfast at Tiffany’s. She said of her role that it was “one of the jazziest of my career,” contrary to her introverted nature and thus quite difficult to pull off. However, her performance was one of the most iconic roles of the 1960s. The film has retained an enduring popularity to this day. In 2006, the “little black dress” from the film was sold at auction for just under half a million pounds. (3) The proceeds were given to one of Audrey’s charities. In 1959, she stared in The Nun’s Story – quite different to her other roles, this was a challenging portrayal of a young nun, Sister Luke, who trained to be a novice nun before spending time as a missionary in the Congo. Sister Luke also faces a painful spiritual dilemma as she returns to Belgium and the Nazi occupation. With some parallels to her own life, the film showed the multifaceted acting talents of Audrey Hepburn. From 1967, after 15 years in film, Audrey acted only occasionally. She spent more time with her family and also working with UNICEF. She was appointed as a special ambassador to UNICEF and became actively involved in campaigns to improve conditions for children around the world. After returning from Somalia in 1992, Audrey Hepburn developed cancer of the colon. The disease proved to be untreatable, and in January 1993 she died in Switzerland aged 63.